Introduction to the Practice of Statistics (IPS) shows students how to produce and interpret data from real-world contexts—doing the same type of data gathering and analysis that working statisticians in all kinds of businesses and institutions do every day. 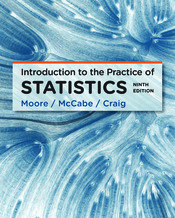 With this phenomenally successful approach originally developed by David Moore and George McCabe, statistics is more than just a collection of techniques and formulas. Instead, students develop a systematic way of thinking about data, with a focus on problem-solving that helps them understand statistical concepts and master statistical reasoning.